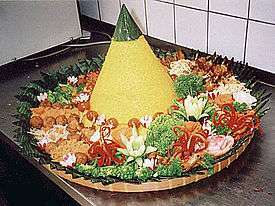 Tumpeng, the cone shaped rice surrounded by assorted Indonesian dishes. 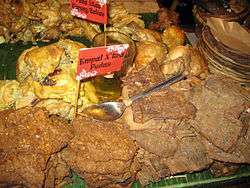 This is a list of selected dishes found in Indonesian cuisine. Ayam bakar Nationwide Grilled chicken Charcoal-grilled spiced chicken. Ayam goreng Nationwide Fried chicken Deep fried spiced chicken in coconut oil. Ayam Kalasan Kalasan, Yogyakarta Fried Chicken Fried free-range-chicken with kremes (crispy granules). Ayam Taliwang Lombok, West Nusa Tenggara Roasted chicken Grilled or fried chicken seasoned with spices halfway during grilling. Bakwan Malang Malang, West Java And Bali Noodle dish Also known as Bakso Malang, meatball noodle soup with fried wontons. Bakso Indonesian Chinese Noodle dish Beef meatballs. Usually served in a bowl of beef broth, with yellow noodles, bihun (rice vermicelli), vegetables, tofu, egg (wrapped within bakso), Chinese green cabbage, bean sprout, sprinkled with fried shallots and celery. Bebek goreng Nationwide Fried duck Traditional seasoned fried duck, served with sambal hot and spicy chili paste. Betutu Bali and Lombok, West Nusa Tenggara Roasted poultry Poultry or duck filled with spicy seasonings, roasted usually for at least 8 hours. Bubur ayam Java Rice porridge (congee) with chicken Rice porridge served with soy sauce, spices, fried shallots, shredded chicken meat, beans, cakwee, krupuk, and sambal. Bubur Manado (Tinutuan) Manado, North Sulawesi Rice porridge (congee) with vegetables and salted fish Rice porridge served with spices, corn, vegetables, cassava or sweet potato, shallots, shredded salted fish, leek, and sambal. Cakalang fufu Manado, North Sulawesi Grilled smoked fish Grilled smoked tuna skipjack fish skewered with bamboo. Cap cai Indonesian Chinese Stir fried vegetable Stir fried of ten types of vegetables dish. There are two types of Cap Cai, Red and White. Red uses Indonesian Tomato Sauce or Ketchup to give it a distinct sweet flavour, while the white one has nothing added to it. Daun ubi tumbuk Sumatra, Kalimantan, Sulawesi Vegetable dish Pounded cassava leaf in spices. Empal gentong Cirebon, West Java Meat soup Mutton or goat offal soup. Empal gepuk West Java Meat Beef shank smashed until soft then soaked in coconut milk. It is then fried when made to order. Gado-gado Java Vegetarian food A mixture of vegetables, shrimp or fish crackers with peanut sauce. Often dubbed the Indonesian salad. Gudeg Yogyakarta, Central Java Vegetable and meat in coconut milk sauce Unripe jackfruit boiled for hours in palm sugar and coconut milk, added with spices for its sweet flavour and brown colour. Served with rice, boiled egg, chicken, and sambal krechek. 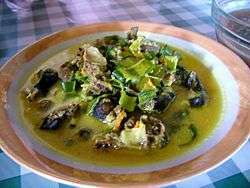 Gulai Nationwide Meat or vegetable soup Indonesian curry characterised with yellow colour from turmeric and coconut milk. Iga penyet Java Fried ribs Fried squeezed beef spare ribs with chili shrimp sauce (sambal terasi). Ikan bakar Nationwide Grilled fish Charcoal-grilled spiced fish/seafood. Karedok West Java Vegetarian food Raw vegetables served with peanut sauce. An equivalent to Jakarta's Gado-Gado (It's close to East Java pecel, but karedok uses raw vegetables). Ketoprak Jakarta Vegetarian food Similar to gado-gado but is served with bihun(rice vermiceli) and salty, hence the whole dish is sometimes called "Bakmi Ketoprak"/Ketoprak noodle). 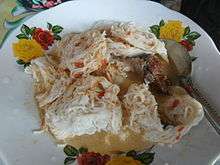 Ketupat sayur Betawi, Jakarta, also Padang West Sumatra Chicken or meat soup with rice cake Pressed rice cake served with chicken or meat soup in coconut milk, chayote, jackfruit, and kerupuk. Krechek Java cow skin spicy stew Chili sauce made from krupuk kulit (skin cracker), potato, and soy beans. Krengsengan Mutton sautee with sweet soy sauce aka kecap manis and petis udang, the Indonesian translation for Black Shrimp Paste). Kwetiau ayam Indonesian Chinese Noodle dish Flat noodle with chicken, sometimes served with pangsi (wonton) and bakso (meatball) soup. 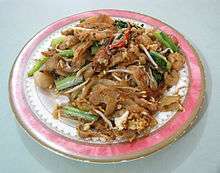 Kwetiau goreng Indonesian Chinese Noodle dish Stir fried flat noodle, similar to char kway teow. Laksa Banjar Banjarmasin, South Kalimantan Spicy noodle dish Steamed noodle-like balls, made from rice flour paste, served in thick yellowish soup made from coconut milk, ground spices and snakehead fish broth. Laksa Bogor Bogor Spicy noodle dish The popular one in Indonesia is Laksa Bogor that contains rice vermicelli, beansprouts, and oncom. Laksa Jakarta Jakarta Spicy noodle dish Jakarta laksa contains rice vermicelli, beansprouts, and dried shrimp broth soup. 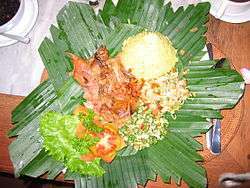 Lawar Bali Vegetable and meat dish A traditional Balinese cuisine dish served with rice and other dishes. It consists of shredded unripe jackfruit, young banana flower, a liberal amount of pork rind bits, raw pig blood. These are mashed with a plethora of herbs such as lemon grass, kaffir lime leaves, shallots, and garlic. Lontong Cap Go Meh Jakarta, Indonesian Chinese Pressed rice cake served with soup Lontong (pressed rice cake) served in soup, chicken, egg and meat, especially served on the fifteenth day of the first month of each Chinese year/Cap Go Meh. Lontong sayur Betawi, Jakarta Lontong rice cake with egg, tofu and vegetable in coconut milk-based soup Pressed rice cake served with egg and tofu in coconut milk, common beans, chayote, jackfruit, and kerupuk. 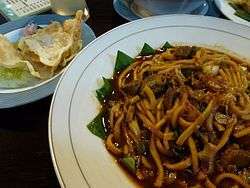 Mie aceh Aceh Noodle dish There are two variations: fried and dry and soupy. Usually made with goat meat or seafood and served with emping, slices of shallots, cucumber, and lime. 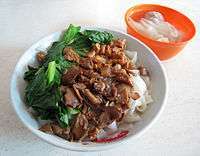 Mie ayam Indonesian Chinese Noodle dish Also known as Cui Mie. 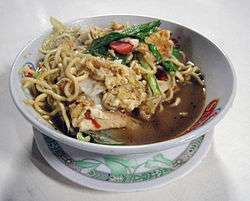 Mie celor Palembang, South Sumatra Noodle dish A noodle and egg dish. With beansprout and fried shallots. The white sauce is made with mixture of "ebi" or dried shrimp that gaves unique taste. Mie goreng Indonesian Chinese Noodle dish (Fried Noodles) served with eggs, sometimes chicken, beef or seafood, with assorted vegetables such as thinly sliced carrots, (bok choi) or Chinese cabbage. Mie kangkung Jakarta Noodle dish Noodle served with kangkung (water spinach). Mie kocok Bandung, West Java Noodle dish Noodle in beef broth served with cow's tendons or cartilage. Mie rebus Indonesian Chinese and Javanese Noodle dish Boiled noodle soup. Nasi campur (Nasi Rames) Nationwide Rice dish (Mixed Rice) rice with assorted vegetables and meat of choice. Nasi goreng Nationwide Rice dish (Fried Rice) steamed rice stir-fried with eggs, meatballs, chicken/beef/shrimp, assorted vegetables. The rice is made brown with thick and sweet soy sauce (kecap manis). Nasi kuning Nationwide Rice dish Usually eaten during special event. The rice is cooked with coconut milk and turmeric, hence the name nasi kuning (yellow rice). It is usually served with more variety of side dishes than nasi campur. Nasi liwet Solo, Central Java Rice dish Usually rice processed with coconut milk and served with chicken, egg, and spicy broth. Nasi Padang Padang, Western Sumatra, nationwide Rice dish This term usually means rice with a variety of dishes common in the specific region, cooked in coconut milk and a taste of chili. Nasi pecel Java Vegetarian food Rice served with cooked vegetables and peanut sauce. The vegetables are usually kangkung or water spinach, long beans, cassava leaves, papaya leaves, and in East Java often used kembang turi. 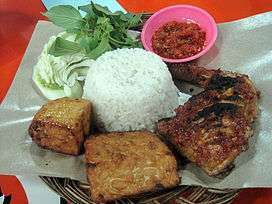 Taste best when eaten with fried tempeh and traditional cracker. Popular in East and Central Java. Nasi tim Indonesian Chinese Rice dish Steamed rice usually served with chicken and mushroom. Nasi uduk Jakarta Rice dish Steamed rice served with variety of vegetables and meat of choice. It is similar to Nasi Rames, but the rice is steamed. A similar dish found in Malaysia or Singapore is called Nasi Lemak. Nasi ulam Jakarta Rice dish Steamed rice mixed with kuah semur (sweet soy sauce soup), serundeng (coconut granules) and peanut granules, sliced cucumber and bean sprouts; served with variety of vegetables and meat of choice toppings, such as dendeng daging (beef jerky), omelette, anchovy, fried tempeh and tofu, rice vermicelli, fried mashed potato. 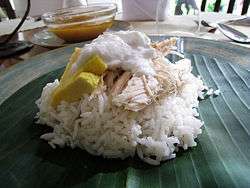 It is similar to Nasi Uduk and Nasi Rames, but the rice is mixed. Oncom West Java Fermented food Fermented beans using Neurospora intermedia mould. Opor Ayam Nationwide Meat soup Chicken cooked in coconut milk. Traditionally consumed with ketupat during the Idul Fitri celebration in many parts of Indonesia. 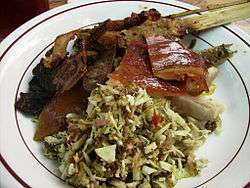 Paniki North Sulawesi Roasted meat, exotic food Bat cooked in Minahasan style. Papeda Maluku and Papua Congee Sago congee, the staple food of Eastern Indonesia. Pecel Lele East Java, also nationwide Fried fish Fried catfish with sambal. Pempek Palembang, Southern Sumatra, also nationwide Fried fishcake Fried fishcake in sweet, sour, and spicy vinegar sauce. 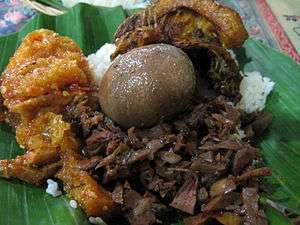 Pepes West Java, also nationwide Cooked food in banana-leaf Fish, meat, tofu, oncom, anchovy, mushroom or any other ingredients cooked inside a banana-leaf package. Perkedel Jagung Nationwide Fried dish corn fritters. Babi Guling Bali Roasted meat Balinese cuisine-style roast pork; comparable to Hawaiian luau-style pig. Rawon East Java Meat soup A beef soup in dark soup. The dark colour comes from the meaty seeds of kluwak nuts. Usually served with uncooked mung bean sprouts and salty duck eggs. Rendang Minangkabau, West Sumatra, Southern Sumatra, Java Meat dish Chunks of beef stewed in coconut milk and chili gravy. Roti cane Aceh, Medan, and West Sumatra or areas with Indian communities. Bread with beef curry Indian type bread with chunks of beef curry. Saksang Batak highlands Meat stew Pork or dog meat (or more rarely, water buffalo meat), cooked in its blood, mixed with coconut milk and spices (including kaffir lime and bay leaves, coriander, shallot, garlic, chili pepper and Thai pepper, lemongrass, ginger, galangal, turmeric and andaliman. Sambal goreng teri Nationwide Salted anchovy Spicy salted anchovy with peanuts. Sate or satay Java and Sumatra, nationwide Roasted skewered meat Skewered barbecued meat that usually had peanut sauce, or sweet soy sauce. Many type of satay has developed throughout Indonesia. Sate lilit Bali Roasted skewered meat Minced meat (pork, fish, or chicken) spiced and wrapped around bamboo or lemongrass stick as handle and grilled on charcoal. Sayur asem Nationwide Vegetable soup (Sour Dish/Tamarind Dish) clear soup with assorted vegetables such as: (melinjo) or gnetum gnemon, melinjo leaves, sweet corn (still on the cobs), young papaya, peanuts, and tamarind. 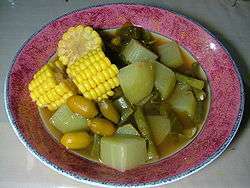 Sayur lodeh Nationwide Vegetable soup (Mixed Vegetables in Coconut Milk Stew). Sayur Nganten Betawi and West Java Vegetable soup Soup made of trubuk stem. Seblak Bandung, West Java Savoury wet krupuk A savoury and spicy dish made of wet krupuk (traditional Indonesian crackers) cooked with scrambled egg, vegetables, and other protein sources; either chicken, seafood, or slices of beef sausages, stir-fried with spicy sauces including garlic, shallot, sweet soy sauce, and chili sauce. Se'i Kupang, Timor Smoked meat With smoking or fumigation by using a mixture of salt and spices gives a unique taste. Selat solo Solo, Central Java Beefsteak and salad, European-Javanese fusion Braised beef tenderloin served in thin watery sauce, served with vegetables and potato. 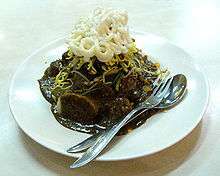 Semur Nationwide Stew Stew made of kecap manis (sweet soy sauce) and spices, usually uses beef. Sop buntut Java Meat Soup or Roasted meat (Ox-tail) served in clear soup (in which case the dish is called Sop Buntut/Ox-tail soup) or roasted alone then served with barbecue sauce. 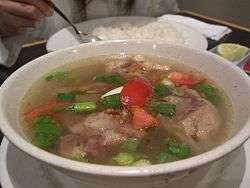 Soto or sroto or coto Nationwide Meat soup A soup of chicken or beef. 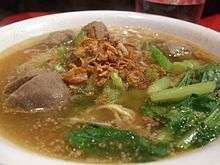 Many variants of soto has developed across Indonesia. Many types of soto have the colour of yellow because turmeric is added as one of the ingredients. Tekwan Palembang, Southern Sumatra Fishcake soup A soup of fishcake with bangkoang and mushroom. Tauge goreng Bogor, West Java Stir fried bean sprout A savoury vegetarian dish made of stir fried tauge (bean sprouts) with slices of tofu, ketupat rice cake and yellow noodle, served in spicy oncom-based sauce..
Telur pindang Nationwide Egg dish Hard boiled eggs boiled in water mixed with salt, shallot skins, teak leaf and other spices. 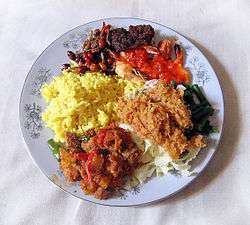 Tempe Nationwide Fermented food Can be cooked into various dishes; such as tempe bacem, tempe goreng, tempe orek, tumis tempe. Sambal tempoyak Sumatra and Kalimantan Fermented food spicy condiment Durian fermented with mixture of salt for three to five days, mixed with ground chili and shrimp paste. Tempoyak ikan patin Palembang Fish curry Catfish served in sweet and spicy fermented durian curry. Tinutuan or Bubur Manado Manado, North Sulawesi Rice porridge (congee) with vegetables Rice porridge mixed with various vegetables such as spinach, kangkung, corn, and sweet potato or cassava. 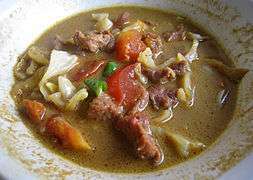 Tongseng Solo, Central Java Meat soup Goat meat or beef stew dishes in curry-like soup with vegetables and kecap manis (sweet soy sauce). Tumis Kangkung Java Vegetarian dish Stir fry kangkung vegetable. Tumpang Central Java Fermented tempeh dish Similar to gulai, but rotten tempeh is used as seasoning instead of turmeric. Might add other ingredients such as beef ligaments. 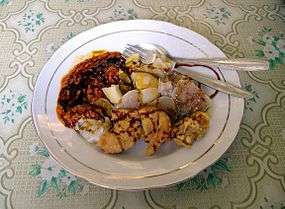 This dish can be found in Central and western part of East Java. Tumpeng Java Rice dish Cone shaped rice surrounded with assorted dishes). 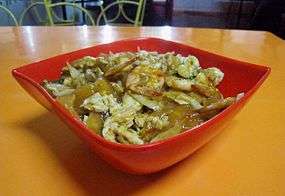 Woku Manado, North Sulawesi Spicy dish Chicken or seafood in spicy sauce. Arem-arem Java Rice cake Similar like lontong, but flavoured with coconut milk, and stuffed with cooked ground meat, or tofu and tempeh. 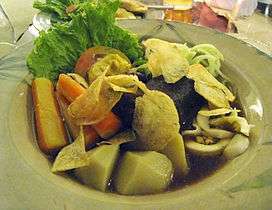 Asinan Betawi Jakarta Vegetarian food A pickled (through brined or vinegared) vegetable or fruit dish. Bakcang Chinese Indonesian Rice cake Rice cake filled with meats, sometimes beans and mushroom, wrapped in bamboo leaves. Batagor West Java Fishcake and dumpling Batagor is actually an abbreviation of bakso tahu goreng (which literally means fried tofu and meatballs), it's a variant of the siomay in which the siomay was deep-fried. Burasa Makassar, South Sulawesi Rice cake Rice and coconut milk cake wrapped in banana leaves. Cimol Bandung, West Java A small snack made from rounded tapioca flour doughs which is then fried. Cimol comes from Banten, West Java. Emping Nationwide Crakers Crackers made from flattened Gnemon/Belinjo seeds. Kembang Tahu Indonesian Chinese Tofu and soy food Soft tofu with sweet ginger sauce. Kerak Telor Jakarta Egg dish It is made from chicken or duck egg made into omelette which is mixed with rice and spice, it is served with coconut granules. 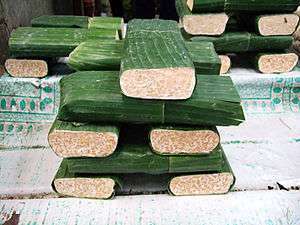 Lemper Java Rice cake Made from glutinous rice and filled usually with chicken. Lumpia Semarang Semarang, Central Java Spring roll Semarang style spring roll, made mainly from cooked bamboo shoots and chicken/prawn. Sometimes boiled quail egg is added. It is eaten with a dipping sauce made from coconut sugar, vinegar and garlic. Martabak Nationwide Egg dish or pancake Indonesian's version of Murtabak, sometimes filled with beef and scallions, or shreds of peanut and chocolate. Mendoan Central Java Fried food Deep fried battered tempeh, cooked lightly in a short time and resulted in limp texture. 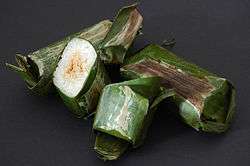 Otak-otak Nationwide Fishcake Usually made from Spanish mackarel fish paste or Milkfish, spiced and wrapped in banana leaves, then grilled and served with peanut sauce. Panada Manado, North Sulawesi Bread Fried bread filled with spicy tuna. Pastel Nationwide Fried dumpling Fried flour dumpling filled with vegetables and meat. Risoles Nationwide Spring roll Fried rolls with breadcrumbs filled with vegetables and meat. 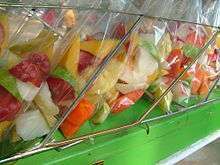 Rujak Nationwide Fruit or vegetable salad There are many kinds of rujak, the most common one is Rujak Buah (fruit rujak). Rujak manis, is a mixture of fruit covered with sweet and spicy coconut sugar sauce, sometimes ground peanut is also added to the sauce. 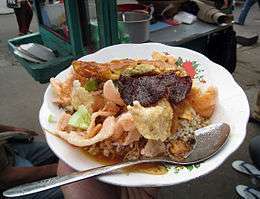 Rujak cingur Surabaya Vegetables with cow's lips A mixture of vegetables, tofu, tempeh, lontong rice cake, beansprouts with petis black fish paste sauce and slices of boiled cow's lips. Rujak juhi Jakarta, Indonesian Chinese Vegetables with salted cuttlefish A mixture of vegetables, tofu, noodles, lontong rice cake, potato, and juhi salted cuttlefish served in spicy peanut sauce. Rujak Shanghai Jakarta, Indonesian Chinese Vegetables with boiled seafood A mixture of kangkung water spinach, preserved squid, edible jellyfish, daikon and cucumber, served in thick red-colored sweet and sour sauce, sprinkled with peanuts granules and sambal. 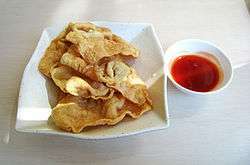 Pangsit goreng Indonesian Chinese Wonton dish Fried wonton filled with chicken or shrimp with sweet and sour sauce. Pempek Palembang, Southern Sumatra area Fishcake A signature dish of Palembang. Fish paste mixed with flour and then deep fried. Served with cucumber, noodles or bihun, as in ketoprak, and thin sauce made from tamarind, vinegar and pounded dried shrimp. Siomay Indonesian Chinese, West Java Fishcake and dumpling A light meal which has a similar form to Chinese Dim Sum, shaped like ice cream cone except the bottom is flat and made traditionally from mackerel fish meat served with peanut sauce, sometimes added with key lime and/or soy sauce. 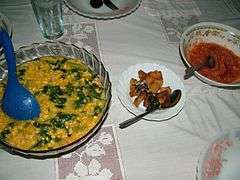 Sometimes the main ingredient can be made from prawn or other fish, siomay could also be served with steamed chicken eggs, potatoes, cabbage or bitter gourd. Serabi/Surabi Nationwide Pancake An Indonesian snack that is made from rice flour with coconut milk or just plain shredded coconut as an emulsifier. 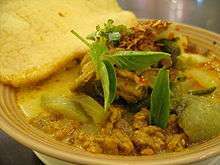 Do keep in mind that each province in Indonesia has varying Srabi recipes corresponding to local tastes and available ingredients. Tahu Aci & Tahu Pletok Tegal, Central Java Tofu and soy food A small snack made from tofu and flour. Its come from Tegal, Central Java. Tahu gejrot Cirebon, West Java Tofu and soy food Deep fried tofu, served with a sauce made from coconut sugar, sweet soy sauce/kecap manis, chili, garlic and shallot. Tahu Gunting Surabaya, East Java Tofu and soy food Deep fried tofu cut with scissors, served with a sauce made from rice flour, peanuts and chili. Tahu sumedang Sumedang, West Java Tofu and soy food Deep fried tofu, served with sweet soy sauce/kecap manis and chili. Tempeh Bacem Java Soy food Tempeh stewed in coconut sugar and spices, then deep fried. It has sweet and savoury flavour. Terang Bulan Bangka Belitung, Sumatra, nationwide Pastry Originally a Chinese snack, but nowadays it is labelled as murtabak. Tahu Indonesian Chinese, nationwide Tofu and soy food Chinese origin, basically a soy milk cheese. It can be fried, stir fried, stewed, as soup ingredient, even also for sweets such as ice cream or vegetarian fruit dessert/pudding. Uli bakar West Java Sticky rice Grilled sticky rice, commonly eaten with oncom or serundeng grated coconut. Angsle Java A mix of melinjo, glutinous rice, peanut, sago pearl, white bread, coconut milk, screwpine leaf, ginger and milk. 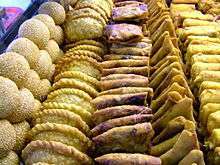 Bakpia Pathok Yogyakarta Bean cake A small patty of baked pastry filled with sweet mung bean paste. Brem (solid snack) Madiun Java Sweet snack Brem is made from fermented tape. 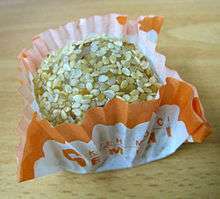 Brem is a special snack from Madiun, East Java. The liquid version is light alcoholic beverage also called Brem originated from Bali. Bubur candil Java Glutinous rice cake ball stewed in gula jawa (palm sugar), served with thick coconut milk. Bubur kacang hijau Nationwide Sweet porridge Green beans porridge, sweetened with sugar, and served with thick coconut milk. Bubur ketan hitam Nationwide Sweet porridge Black glutinous rice porridge, sweetened with sugar, and served with thick coconut milk. Cendil Java Sweet rice and coconut cake Rice flour-based small glutinous cake, sweetened with sugar, moulded and coloured. Served with fresh grated coconut. Dodol Java Sweets Rice flour-based small glutinous sweets, sweetened with coconut sugar, moulded and coloured. 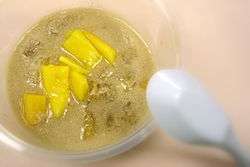 Often add fruit scent and taste such as durian. Geplak Sweet made from sugar and grated coconut. Getuk Java Cassava cake Cassava paste, sweetened with sugar and moulded in a special tools that it resembles noodles. Often served with fresh grated coconut. Klepon Nationwide Sweet glutinous rice balls and coconut Glutinous rice cake balls, usually coloured and flavoured with pandan leaves, which gives it an attractive green colour and unique aroma, filled with coconut sugar. The balls are boiled, and rolled in grated coconut. 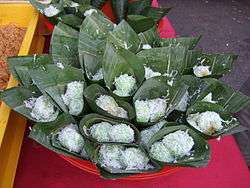 In other parts of Indonesia such as Sumatra, klepon is called onde-onde. Kolak Nationwide Sweet cocktail A mix of sweet potato, cassava, banana, pumpkin, diced in bite size pieces and stewed in coconut milk and palm sugar. Sometimes vanilla or ginger are added for extra flavour. Klepon Nationwide Sweet coconut cake Boiled rice cake, stuffed with coconut sugar, and rolled in fresh grated coconut. 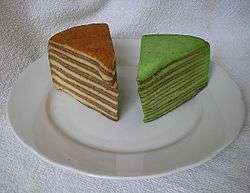 It is flavoured with pandan leaves juice. Kue putu Nationwide Sweet coconut cake Similar to klepon, except that it's cylindrical in shape whilst klepon is spherical. Lapis Legit Nationwide Layered cake A spiced layered cake, made mainly of egg yolk, flour and margarine/butter. Lupis (food) Java Glutinous rice cake Glutinous rice cake wrapped and cooked in banana leaves, served with grated coconut and drizzled with thick coconut sugar syrup. Mochi Chinese and Japanese Indonesian Sweet rice cake Rice flour based cake filled with peanuts paste, sometimes sprinkled with sesame seeds. Nagasari Nationwide Banana cake Steamed rice cake wrapped in banana leaves, and stuffed with banana. Onde-onde Nationwide, possibly Chinese-Indonesian derived Sweet sesame rice balls Glutinous rice cake balls, filled with sweet green beans paste, and rolled in sesame seed and then fried. Pisang Goreng Nationwide fritters (Fried Banana), battered and deep fried banana/plantain. Roti buaya Jakarta Bread, pastry Crocodile-shaped bread commonly served during Betawi wedding and celebrations. Wingko Semarang, Central Java Coconut cake Sweet baked coconut snack. Acar Nationwide Pickles Various chopped vegetables in vinegar. Bawang goreng Nationwide Spinkle dry condiments Crispy fried shallots sprinkled upon various dishes to give aroma and crispy texture. Dabu-dabu North Sulawesi Sauce Sliced chili, tomatoes and shallots. Condiments for grilled fish. 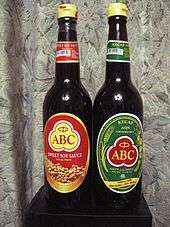 Kecap manis and kecap asin Nationwide Sauce Soy sauces, available in sweet and salty. Pecel Java Sauce A mixture of vegetables and traditional cracker with spicy peanut paste. 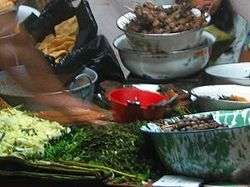 Madiun and blitar in East Java is popular for their pecel. Sambal Nationwide Sauce Chili sauce with rich variants across Indonesia, among other uses shrimp paste. Serundeng Java Spinkle dry condiments Grated coconut sauteed and spiced, could be served with beef, sprinkled on soto, or eaten with sticky rice. Tumpang Java Sauce Tumpang or sambal tumpang is a typical food from Kediri, East Java. 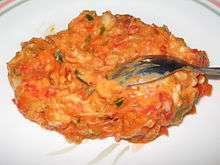 Sambal tumpang has been made of rotten tempeh mixed and cooked with various spices such as chilli, onion, salt and other spices. 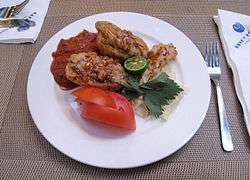 ↑ "Ayam Bakar Bumbu Rujak". Tasty Indonesian Food.com. Tasty Indonesian Food.com. Retrieved 11 August 2013. 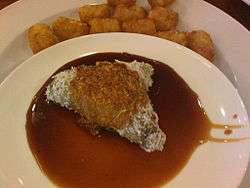 ↑ "Ayam Goreng Lengkuas". Tasty Indonesian Food.com. Tasty Indonesian Food.com. Retrieved 11 August 2013. ↑ Trifitria S Nuragustina (24 September 2013). "Rela Antre Demi Iga Sapi Penyet" (in Indonesian). Femina. Retrieved 12 January 2014. ↑ "Ikan Bakar". Tasty Indonesian Food.com. Tasty Indonesian Food.com. Retrieved 11 August 2013. ↑ Watson, Todd (20 July 2013). 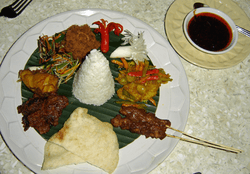 "Indonesian cuisine: An unduly underappreciated taste". Inside Investor. Retrieved 12 June 2014. ↑ Taylor, Jean Gelman (2003). Indonesia: Peoples and Histories. New Haven and London: Yale University Press. p. 46. ISBN 0-300-10518-5.